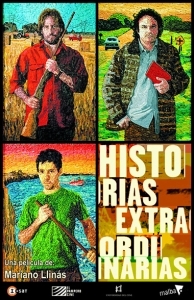 Clocking in at a whopping 245 minutes, Mariano Llinás’ Extraordinary Stories (Historias extraordinarias, 2008) is a film that not only demands your attention, but kindly requests a whole afternoon of your time. A compendium of far-fetched, yet compelling tales, this audacious experiment into the art of storytelling is a narratively dense affair that succeeds in holding your attention through its charmingly carefree, flippant manner. Llinás’ oddity focuses primarily on three characters whose alternating plot strands spin off in countless directions (yet never once intersect one another) – known simply as X, Z and H.
Using an incredibly informal style of narration, Llinás describes both what we’re seeing and what each of our protagonists are thinking. Through this voiceover we witness a world of desperate criminals, murder, missing persons and the peculiar discover of a lion known only as ‘The Colonel’. Immersing us in a maze of narratives – cut, sliced and spread unevenly across numerous chapters – it can often be hard to keep up with this intricate study of storytelling. The cinematic equivalent of reading three books at the same time, drifting in and out of each in whatever direction your mood takes you, Llinás complicates matters further by dovetailing these plots and disturbing the film’s rhythm with further characters. It’s hard not to leaf through the numerous literary comparisons that Extraordinary Stories evokes, with the craft of storytelling not just the subject to this colossal film, it’s also its inspiration. From the film’s titanic runtime to its reliance of flippant and often impractical narration, Llinás presents us with the ultimate example of the restrictions of cinema, especially as a medium for the adaptation of literature – revealing narrative methods we’re often denied through conventional filmmaking and demonstrating exactly what this is. Just before entering Extraordinary Stories’ final third, Llinás warns us that whilst this is where the end begins, the stories will become more vague whilst they head to their natural conclusion. Llinás then proceeds to tell us how each narrative will end, going into to great details of each protagonist’s fate. However, this carefree spoiler in no way hampers our enjoyment of the events that unfold – proving that it’s not what happens that dictates our enjoyment of a story, but how it’s told to us. The East End Film Festival takes place from 25 June to 10 July, 2013. For more of our EEFF 2013 coverage, simply follow this link.